It's pretty obvious by now, I love collecting children's books. Aside from trying to finish my Christmas Countdown collection, right now we usually just add a book or two at holiday time. We have three Halloween books, a Valentine's, a St. Patrick's, and birthday book. I think books, along with crafts, are the best way to get children excited about holidays whether meaningful and religious or of the Hallmark variety. Children love a reason to celebrate and there isn't a better way to explain the holiday's meaning than a well written book. 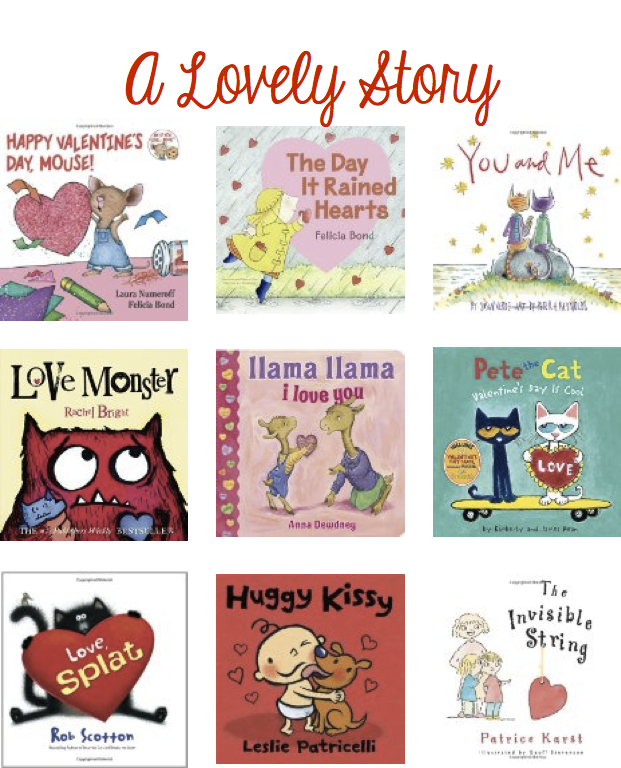 We own Happy Valentine's Day, Mouse (amongst a handful of Mouse books, and love them all) I'm adding The Invisible String this year, of course with some candy hearts, heart shaped stickers, and red and pink finger paints. Do you buy or borrow holiday themed books for your children? What's your favorite way to get them excited about celebrating.... candy?! Hope everyone is enjoying their weekend! I'm off to muster up some feigned excitement for the Super Bowl, since I give squat about either team. I'll probably spend more time prepping for Valentine's with Ashlynn. Reed is getting that Pete the Cat book this year. We loved the Pete Christmas book my mom got him. He so really likes a series of books called "Mouse's First", but for some reason the Valentine one is the only one he doesn't care for. The series is great though, especially the Halloween one. great picks! We got llama llama in our exchange and LOVE it! I've already been scoping out Easter books for the girls! We do books every holiday for my 14 month old - she adores "reading" and i adore that she adores it ;) so what better way to encourage it than new material?! She loves Biscuit books, especially the "touch and feel" ones, so we picked up "What is Love, Biscuit?" for a V-Day gift. Great picks! Great picks!! I actually didn't buy any books this year... I'm a little behind. But I did pick up some window clings at Target that Mason LOVED putting on our windows today. I'm not sure he really "gets" the holidays but it makes it more fun for me now that we have him!